At the conclusion on the 2015-2016 NBA season, fans witnessed a flurry of milestones. Kobe Bryant ends a storied career, LeBron James takes another step towards greatness with his 3rd NBA Championship title, and Steph Curry became the first unanimous MVP in NBA history. So, where does the Greatest of all Time conversation stand these days? 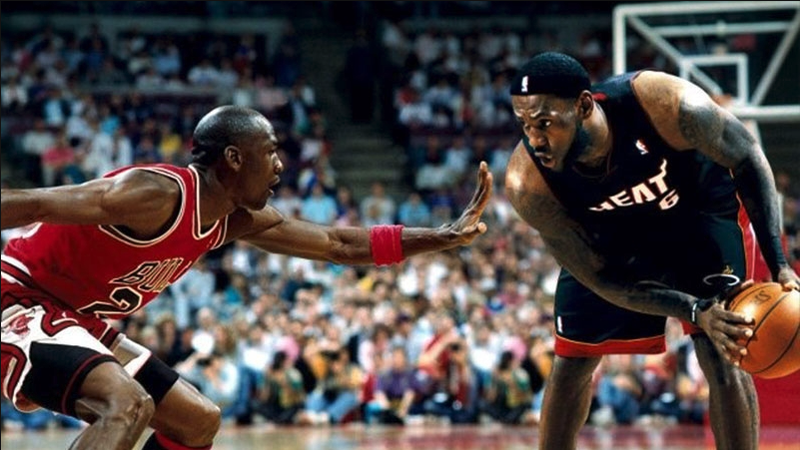 Is Michael Jordan still the G.O.A.T? The simple answer is yes. But, he better watch his back. Now that Kobe has officially hung up his Nikes we can look back and see what he has accomplished over the years. It may surprise a lot of people that he had MORE career points than Michael Jordan. Granted, Bryant entered the NBA straight out of high school (and then there was that whole Jordan baseball thing). But points are points and Kobe was clearly one of the greatest scorers of all time. Bryant also had more game winners (34) than Jordan (28), and more points in a single game (81) compared to Jordan (69). Beyond that Jordan edges out Bryant in almost every other significant category. Jordan has more NBA Championships (6) than Bryant (5), and WAY more MVPs (6) compared to Kobe (1). One could also argue that Kobe was robbed of many MVP awards. Now that Kobe's career is officially over its safe to say that he was one of the greats but never has and never will surpass Jordan. Now this is where things get interesting. LeBron James performance in the 2016 NBA Finals put him on another level. Not only did he win his 3rd Championship in 5 years, he did it beating the best team of all time (GS Warriors) based on single season wins. If you compare 31-year old LeBron James to 31-year old Michael Jordan, he's already surpassed him with more league MVPs (4), more finals appearances (7), more points, and more assists. The only category Jordan has him in is steals, but Jordans defense is also a big reason why he's the greatest of all time. What's even more impressive about LeBron is that he has won Championships with two different teams in a relatively short period of time, proving that he is a big time difference maker. Could Jordan have won 6 Championships without Scottie Pippen? Probably not. So, is LeBron the greatest of all time? Probably not, or at least not yet. His career is far from over though and Jordan won three Championships from the age of 33 to 35. Time will tell whether the King (James) will reign supreme. There are plenty of other standout NBA players with great accomplishments over the years including Magic, Bird, Russell, Wilt, and Shaq. But they were different types of players in a different era. The level of talent and the parity in the league has significantly increased over the years. One could argue that players like Russell and Shaq were physical anomalies who benefited from playing on great teams. The game has changed. And with that change, the criteria for being the greatest will also change. And then there's Steph Curry. He's not even in the conversation, at least not yet. To be continued.